Before I talk about how to generate power, I need to respond to a more basic question first: Why bother generating power at all? With a big enough battery, can’t I power my gadgets for a full 48 hours, and just recharge when I get to civilization? Let’s work with the most relevant example to me, the iPhone. The iPhone charges at 5 volts, the voltage supplied by the USB ports in a computer. The power supplied by a typical USB port starts at 35 milliamps, and a device that’s plugged into the port can auto-negotiate by sending messages over the "data" lines to receive up to 500 milliamps (half an amp). This is what the iPhone does. Whether you plug it into a USB hub, or a USB port directly on the computer, the phone starts drawing 500 milliamps at 5 volts and slowly begins to charge. The iPhone also supports a "quick-charge" mode. Plugged into an iPhone wall adapter (which has special circuitry in it to identify itself), the iPhone can draw up to 1000 milliamps (1 amp). Drawing 1 amp, an iPhone will quick-charge from empty to 80% full in about 90 minutes, then switch to "trickle charging" mode to charge the rest of the way. Do you need an Apple-branded USB hub to charge the iPhone? No, the iPhone will charge off any port that supplies 5 volts. (Besides, there’s no such thing as an Apple-branded USB hub.) When testing their iPhones on USB hubs, many people make the mistake of just plugging the phone into a hub that’s not connected to a running computer. 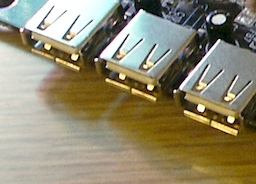 Almost all USB hubs will supply no power unless they are uplinked to a computer that is turned on and awake. Do you need to supply 1 amp to get the iPhone to charge? Nope. As long as an iPhone can see 5 volts on the connection, it will attempt to charge on it. In fact, the power level the iPhone prefers for trickle-charging is the standard USB level of 350ma. That sounds like more than enough to ride out camping for a day, then ride back. But a road-test with the iPhone proves different. If I use it to play music while riding, and check my location on a map every half an hour or so by pressing the "locate me" button, and take the occasional photograph, and make the occasional phone call, I get somewhere around six hours from a full charge. Much less if I’m using the 3G phone with GPS active, constantly downloading map data (which keeps turning the antenna on). A full day of biking followed by enough campsite use to chat with friends and upload pictures could easily surpass two charge cycles. Now add another USB device, for example my GPS tracker. And a USB-charged flashlight to set up my campsite. Still, this seems like it might be enough for a single day of camping. And it’s more than enough for a day-long ride. But what if I add a battery-powered bicycle headlight into the equation? A nice, bright 3 watt LED headlight designed to operate at 6 volts (matching the battery pack) would drain the battery just as fast as a quick-charging iPhone, cutting my available time in half. Why such a fast drain? It’s because of the watts. The relationship between volts, amps, and watts is tricky, even though the equations look simple. You need to pound your head against Ohm’s Law for a while to know what’s going on. To shine at full brightness, the 3 watt bulb in our example will draw close to an amp of power from the battery. The batteries are only good for 10 amp-hours – slightly less, in fact – and when you combine this with a charging iPhone and a GPS unit, we’re drawing over 1.5 amps. And the faster we draw power, the less efficient the batteries will be. In fact, after you factor in all the inefficiency, it turns out that one hour of headlight use would cost me more than one complete charge cycle of the iPhone. Now it’s not looking like such a good idea. I could avoid this by powering the headlights with the bicycle, and charging the iPhone separately with the battery pack… But that means installing a generator of some kind for the headlights. And if I’m going to do that, then why not use the same generator to charge the battery pack during the day, when I don’t need the headlights? So yes, I do need to generate power. (Either that, or haul around a huge battery.) Now I can finally ask the question: How do I make it? At first, I looked for easy solutions. I was expecting that any solution involving a generator would be hugely inefficient, or heavy, or require welding experience, so I went looking at solar power and wind power instead. Both had problems. Then I did some more research and realized that using a generator would be easier – much easier – than I thought. There are several devices on the market right now that combine rugged solar panels with batteries. You can mount these on the rear of your bike or even your helmet. In good weather, when you’re out riding under the hot sun, you can put some of that light to good use. Even so, the real advantage of solar panels comes when you are off your bike. Assuming you set up camp somewhere without electricity, and feel alright about leaving your gear in the open to soak up some sunlight, you can store enough power to charge your gadgets. But you’ll need a large panel to store enough for a sufficiently bright headlight, and you’ll need to consider how heavy that panel will be as you haul it from place to place. I probably would have chosen a solar panel, except for one thing: A solar panel is useless at night. If you’re riding at night and your battery quits, there is nothing you can do. Unlike solar, at least wind power takes advantage of the motion of the bike, but wind power is unpredictable and the few approaches I’ve seen for putting a turbine on a bicycle are very awkward. And like solar, the power is dependent on the weather conditions. I have seen a prototype of an invention that acts as a generator while the bike is in motion (in the form of a wheel rolling on the ground, tethered to the back of the bike) and acts as a wind turbine while the bike is at rest (if you unfold it and place it on a flat surface nearby), but it was a prototype only and appeared too flimsy for regular use. If you put a plane on a long conveyer belt, and ran the conveyor belt backwards, and started the plane so it began moving forwards, could you eventually take off? Yes, and quite easily. People are too used to thinking about cars, where the wheels transfer the driving force. On a plane the wheels just keep the plane from hitting the ground. It would be trivially easy for the plane to overtake the speed of the conveyor belt, and fly right off it, since the plane is pulling itself along the wind, not along the ground. The wheels would spin faster but the plane would barely notice. An equivalent question would be, is a speedboat able to cross a lake when there’s a headwind? Of course. A dynamo is basically an electric motor working in reverse. In an electric motor, you run electricity through wires to push magnets attached to a wheel, turning the wheel. In a dynamo, you turn a wheel which moves magnets around, pushing electricity through wires. So the faster you turn the wheel, the more electricity you get. Bike dynamos come in two major types: The sidewall dynamo and the hub dynamo. A sidewall dynamo is a device shaped like a miniature wine bottle, with a rough-edged wheel attached where the cork would be. The idea is that you anchor this thing to one of the struts on your bike along the inside edge of a wheel, positioning it so that the little wheel on the dynamo is touching the sidewall of the tire. As your bike wheel turns, the little wheel of the dynamo rolls along the endless circle formed by the rim, turning magnets inside the wine bottle, generating DC power. A spring in the anchoring mechanism keeps the dynamo pressed to the rim even if the rim is warped. (Every bike wheel on the road today is at least a little bit warped). The major drawback to a sidewall dynamo (or "bottle dynamo" as it’s sometimes called) is the friction involved. To deal with the warping in the rim you need a spring applying slight but constant pressure, anchoring the dynamo wheel to the tire, so the wheel gets enough purchase to be turned by friction. That friction is just wasted energy, and riding around with it is like riding around with a tiny handbrake on your bike, working constantly against you, giving you nothing. Because of this problem, sidewall dynamos are usually built with a cable or a lever attached so you can pull them completely away from the wheel when you don’t need electricity. Reading this description you may get the idea that a sidewall dynamo adds a lot of extra resistance to a bike, making the bike much harder to pedal – and it’s true, there are some really crappy dynamos out there that are only bearable for short distances – but in general the increase in effort is equivalent to the difference between pedaling a bike in shorts vs. pedaling in pants. You wouldn’t want to do it all day, and I personally think it would be ridiculous to use one for a cross-country tour, but if it’s the only thing keeping your headlamp alive on a dark night as you pedal home from Karaoke night at the King of Clubs, then better to have it than not! The other type of bicycle dynamo is a hub dynamo. You don’t see these much in the U.S., but they’re all over Europe, especially Germany, where there are even widely respected laws regulating their quality and usage. In these new energy conscious times I expect hub dynamos to become more common here in the States. 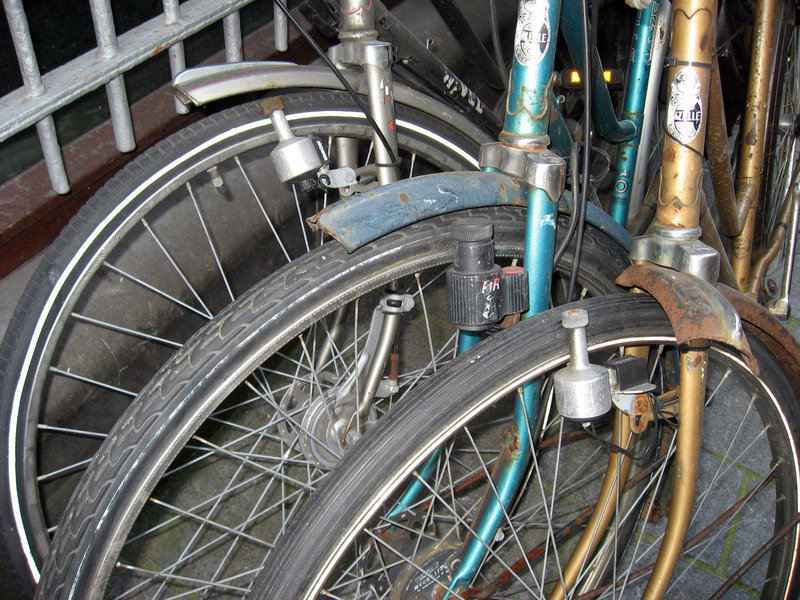 A hub dynamo is a thick cylindrical device that you swap for the axle in one of the wheels of your bike. Inside it are a couple dozen slender magnets arranged in what’s called a "claw-pole" design. The magnets are moved around each other inside the hub by the rotation of the bike wheel, generating electricity with very little friction. To visualize how it works, hold your hands in front of you and make claws with your fingers and thumbs. Draw the tips of the fingers on your right hand inward just a bit more than the fingers on your left hand, so you can fit your right claw inside your left claw. Now rotate your claws in opposite directions. This is what goes on inside the hub. Your fingers are the magnets, passing along each other, creating a magnetic field. Since each group of magnets (left claw and right claw) moves closer to the other group, then farther apart, over and over as they circle around, they pull electricity in cycles through the wires in the hub. Forward, then back. So power that comes out of a hub dynamo is AC power. To power a light or charge batteries you need DC power. So if you’re going to use the electricity generated by a hub dynamo, you need to convert it to DC. This is generally not a problem and can be accomplished with a simple electrical circuit known as a "full-wave bridge rectifier". Well, a bridge rectifier is a really simple circuit. It’s four little components wired together in a diamond shape. But if you use the same materials I use, the TuneCharger board has a bridge rectifier built in. So no worries. Since I plan to ride my bike a lot, and power a lot of electrical devices – not just headlights – with the power I generate, I’m going to go with a hub dynamo. It’s more expensive, but it’s much more mechanically efficient, and the amount of power I can generate in a day’s ride is a big concern to me. I want to be able to spend a day or more exploring whatever spot I ride to, and keep my gadgets charged the whole time. So, by process of elimination, the SON28 is the one for me. Now let’s see about putting it on a wheel. I am looking for a turn key Road Bicycle iPhone with mount Charging kit. Do you know where I can find it? I have a Son 6v dynamo to charge my PP+ V4i. It does a good job with phone and torch batteries, but will it charge an iPad without a transformer to the higher voltage? I’m going on tour soon and I want to take my iPad to blog etc. LightCharge usb charger for bottle and hub dynamo. I have a Bicycle Chain Charger To USB Dynamo 1000mAh and I want to get it to power my iphone 4s. At the moment it won’t charge and i think that’s because it states a 250mAh output. Is there any way that i can get a bridge unit to store and supply power for my phone? I’ve got a iPhone 3GS and just tried a bottle dynamo. But when installed a tested, my phone said it did not support this device. I believe the device was 6volt and the phone is 5volt. I no nothing about amps, volts, ohms and other battery terminology, I just want a power source charger for a European bike trip and would like a recommendation. Please bare in mind, with every iOS up date apple does, they block more and more external, none apple products. So I would like to no what generator is best for me, should I change my phone, what phone is best with which generator?. Look forward to a reply, kindest regards Billy. If I was worried about cooking my iPhone from a hub charger I wouldn’t charge from it. 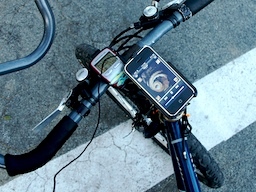 There are a LOT of devices out there that would be absolutely compatible with this type of application that would be really useful on a bike trip. For example, Black Diamond makes a really nifty light that can charge your phone for you, then charge off just about any USB power source. If it does end up getting fried (I have not charged off a hub genny) you only lost $50 bucks instead of $500. Also even if you run the light down you can charge it while using it. 150-4 lumen range, 9 to 300 hr (claimed) usage on a full charge (2600 mAh). You can’t “through charge” to the phone from the hub, so if you’ll need a light and a charger at the same time buy two. It has a tubular metal body of about handlebar diameter so anybody with opposable thumbs should be able to improv a mount. Also has an integral biner ring on the back to hang from tent rooves. Comes with a ~ 3″ (yes, inch) USB cable and no biner, so you’ll need a longer cable. I suggest the Lost and Found at Starbucks. Name of the light is BD Ember. I don’t work for them, I just think it’s a wicked handy little light.